Vegetarian diets are good for lowering cholesterol and inflammation (1), (2). Adding seafood to a vegetarian diet can enrich it with lean protein, heart-healthy fats, and bone-strengthening calcium (3), (4). This combination of foods is known as the Pescatarian diet. A pescatarian diet is also good for the environment and breaks the monotony of a vegetarian diet (5). 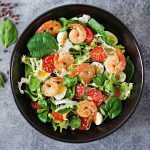 This post tells you why a pescatarian diet is good for you, what to eat, a sample pescatarian diet plan, benefits, and side effects. Keep reading! What Is A Pescatarian Diet And Why Is It Good For You? Fish protein increases satiety as compared to beef and chicken (6). This means you will feel full quickly and not overeat. 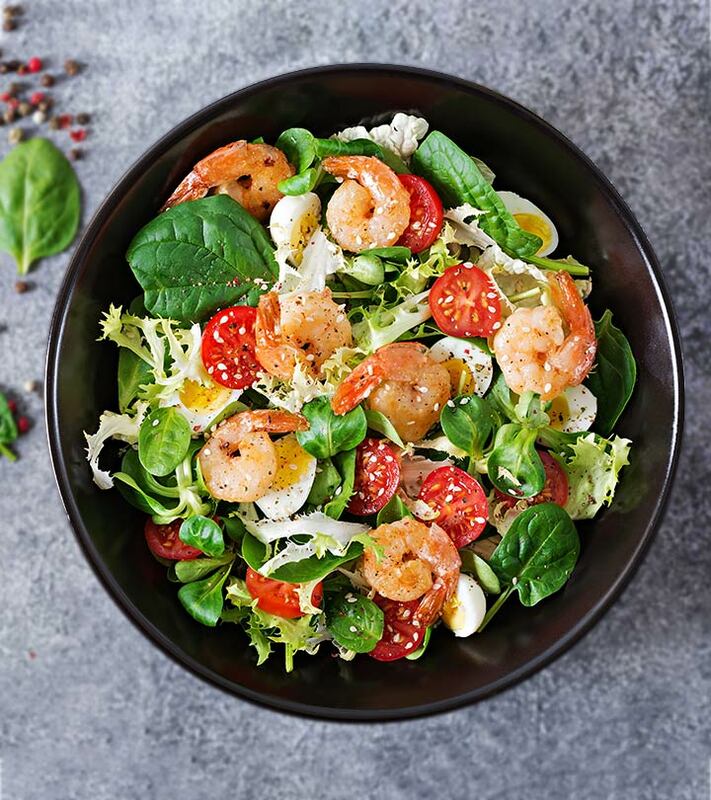 If you are looking to shed some pounds, it’s the right time to start being on a pescatarian diet. Calcium is extremely important for your bone health. Merely eating vegetables does not provide your body with enough calcium. But adding fish to a vegetarian diet does (3)! Fatty fish are great sources of omega-3 fatty acids. These acids help lower inflammation in the body, which, in turn, reduces the risk of obesity, diabetes, and heart disease (7). Compared to other animal proteins, consuming fish contributes lesser to greenhouse gas emission. So, you can protect the environment and your health (5). For some, just eating vegetables, fruit, and nuts can be boring. Adding fish or any other seafood helps improve the taste and overall mood of lunch and/or dinner. Many people are allergic to eggs, lactose intolerant, or may want to avoid eating meat or dairy products. For them, fish can be a good source of complete protein, calcium, and healthy fats. So, what exactly do pescatarians eat? Let’s find out! Seafood Mackerel, bass, haddock, salmon, tuna, Hilsa, sardines, Pomfret, carps, cod, caviar, mussels, crayfish, oyster, prawns, lobster, crab, squid, and scallops. Vegetables Spinach, chard, radish greens, carrot greens, Bengal gram greens, beetroot, carrot, broccoli, cauliflower, cabbage, Chinese cabbage, sweet potato, radish, turnip, parsnip, kale, cucumber, and tomato. Fruits Apple, banana, avocado, strawberries, blackberries, mulberries, blueberries, gooseberries, pineapple, papaya, dragon fruit, passion fruit, watermelon, muskmelon, guava, peach, pear, pluot, plum, and mango. Protein Kidney beans, lentils, fish, mushroom, Bengal gram, sprouts, black-eyed peas, cowpeas, garbanzo beans, soybean, soy milk, edamame, and tofu. Whole Grains Brown rice, barley, broken wheat, sorghum, multigrain bread, and multigrain flour. Fats & Oils Olive oil, avocado oil, fish oil, ghee, sunflower butter, and rice bran oil. Nuts & Seeds Almonds, walnuts, pistachios, macadamia, pine nuts, hazelnuts, sunflower seeds, melon seeds, pumpkin seeds, chia seeds, and flaxseeds. Herbs & Spices Cilantro, dill, fennel, parsley, oregano, thyme, bay leaf, chili flakes, chili powder, Kashmiri red chili powder, turmeric, coriander, cumin, mustard seeds, English mustard, mustard paste, star anise, saffron, cardamom, clove, garlic, cinnamon, ginger, mace, nutmeg, Allspice, onion powder, garlic powder, and ginger powder. Beverages Water, coconut water, detox water, and freshly pressed fruit/vegetable juices. With these ingredients, you can easily come up with a diet plan that’s nutritionally balanced. Take a look at this sample pescatarian diet plan. Apart from this menu plan, you can also make easy pescatarian foods at home and enjoy a healthy meal. Here are three amazing recipes for you! Add olive oil and add the garlic immediately. Let it sizzle for 10 seconds. Add the shrimps and stir-fry for 30 seconds. Add salt and pepper and cook for a minute. 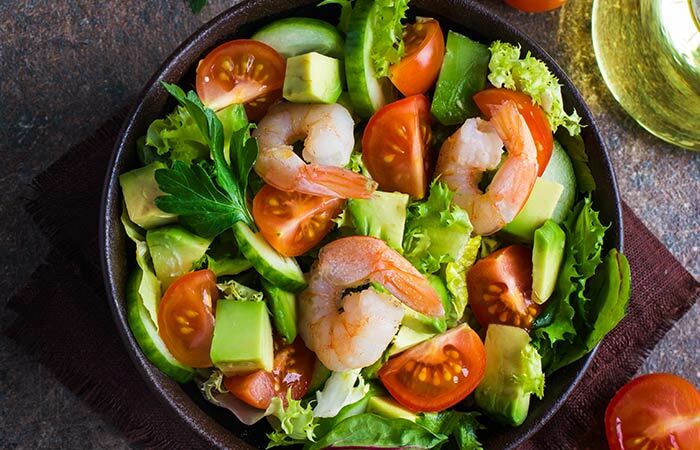 Remove from the flame and add the shrimps to the bowl containing lettuce, tomato, and cucumber. Squeeze in lime juice, a little salt, and a sprinkle of black pepper. Heat a pan and add a generous dollop of unsalted butter. Add in the scallops and let them bubble and sizzle for 2 minutes on each side. Don’t forget to season! Plate the spinach and mixed greens. Add in the fig wedges. Mix olive oil, mixed herbs, salt, and pepper in a bowl. Apply this mix on fish fillet with a brush. Heat a pan and fry the fillet. Add in the veggies and sauté for two minutes. Add the rice and water in a rice cooker and cook. 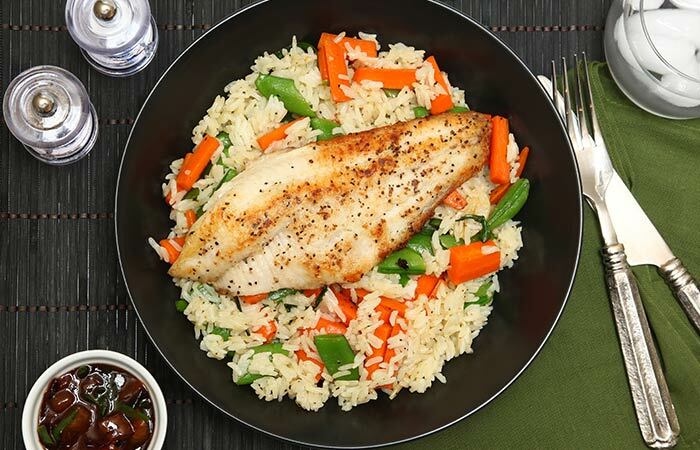 Plate the rice, add in the fish and sautéed veggies. Delicious! Aren’t they? Try them out, you will not be disappointed. 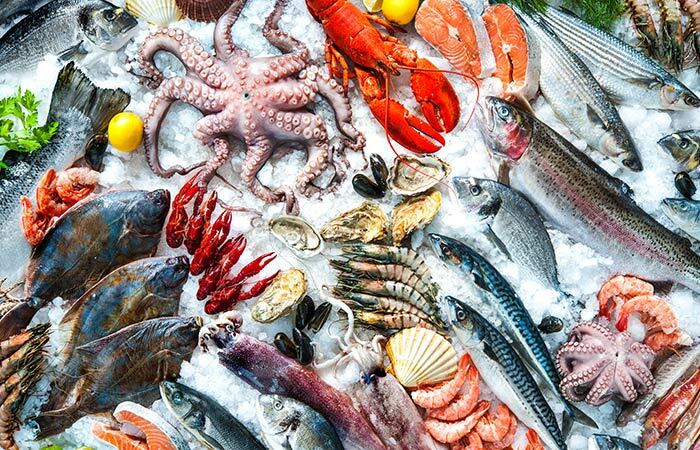 Before coming to a close, let’s quickly take a look at the only caution you should be aware of before starting a pescatarian diet. Due to water pollution, fish sometimes get contaminated with mercury, which may cause mercury poisoning. They are also injected with growth hormones for faster growth to meet the high demand for fish in the consumer market. Consume wild-caught fish and buy fish or any other seafood from a reputable source. 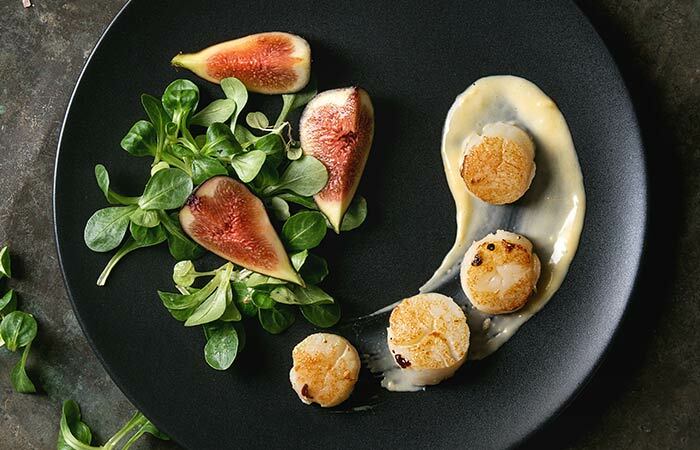 Seafood is a great source of complete protein, healthy fats, vitamins, and minerals. Adding it to your meals will improve the nutrition quality and your overall well-being. Do consult your doctor before doing so and check if you have any seafood allergies. With these points in mind, start being on a pescatarian diet. Cheers! “Association between plant-based diets and plasma lipids: a systematic review and meta-analysis” Nutrition reviews, US National Library of Medicine. “Association of vegetarian diet with inflammatory biomarkers: a systematic review and meta-analysis of observational studies.” Public health nutrition, US National Library of Medicine. “Comparison of Nutritional Quality of the Vegan, Vegetarian, Semi-Vegetarian, Pesco-Vegetarian and Omnivorous Diet” Nutrients, US National Library of Medicine. “A fish a day, keeps the cardiologist away! 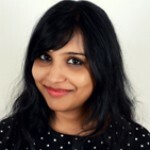 – A review of the effect of omega-3 fatty acids in the cardiovascular system” Indian journal of endocrinology and metabolism, US National Library of Medicine. “Dietary greenhouse gas emissions of meat-eaters, fish-eaters, vegetarians and vegans in the UK” Climatic change, US National Library of Medicine. “A comparison of the effects of beef, chicken and fish protein on satiety and amino acid profiles in lean male subjects.” The Journal of nutrition, US National Library of Medicine. “Omega-3 fatty acids in inflammation and autoimmune diseases.” Journal of the American College of Nutrition, US National Library of Medicine.